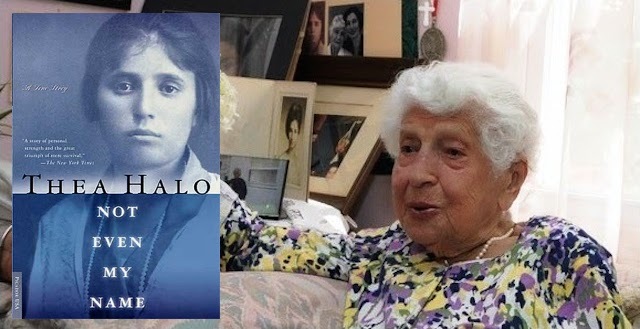 Not Even My Name is the unforgettable story of Sano Halo’s survival of the death march at age 10 that annihilated her family as told to her daughter, Thea and the poignant mother/ daughter pilgrimage to Turkey in search of Sano’s home 70 years after her exile. Sano, a Pontic Greek from a mountain village near the Black Sea, also recounts her ancient, pastoral way of life in the Pontic Mountains. The dreadful realization that something was amiss came little by little to Sano’s village. Strangers began to inhabit the fields and forests, always watching from a distance like birds of prey. Turkish soldiers made periodic raids to seize men for slave labor in foul, lice-infested labor camps, where most died of disease, malnutrition and exposure. Then in the spring of 1920, Turkish soldiers pounded on doors with the butts of their rifles and shouted General Mustafa Kemal’s (Ataturk) proclamation: “You are to leave this place. You are to take with you only what you can carry ” On their death march, victims lay where they fell and buzzards hung above their heads. So ended the 3,000 year history of the Pontic Greeks in Turkey. Stripped of everything she had ever held dear, even her name, at age 15 Sano was sold into marriage to a man who brought her to America. He was three times her age. Not Even My Name follows Sano’s marriage, the raising of her ten children, and her transformation from an innocent girl who lived an ancient way of life in a remote place, to a nurturing mother and determined woman in twentieth-century New York City. Although Turkey actively suppresses the truth about the slaughter of almost 3 million of its Christian minorities – Greek, Armenian, and Assyrian – during and after World War I, and the exile of millions of others, here is a rare, firsthand account of the horrors of that genocide. But Sano’s story is also one of triumph; a brilliant and mesmerizing memoir written in haunting and eloquent prose, Not Even My Name weaves a seamless texture of individual memory that evokes all the suspense and drama of the best told tales. Get Not Even My Name here. A survivor’s tale from Turkish death marches in 1920 that killed thousands of ethnic Greeks. Young Themia lost family, freedom, even her name – changed to Sano by her cruel mistress. Her daughter tells the sad story with simple grace.